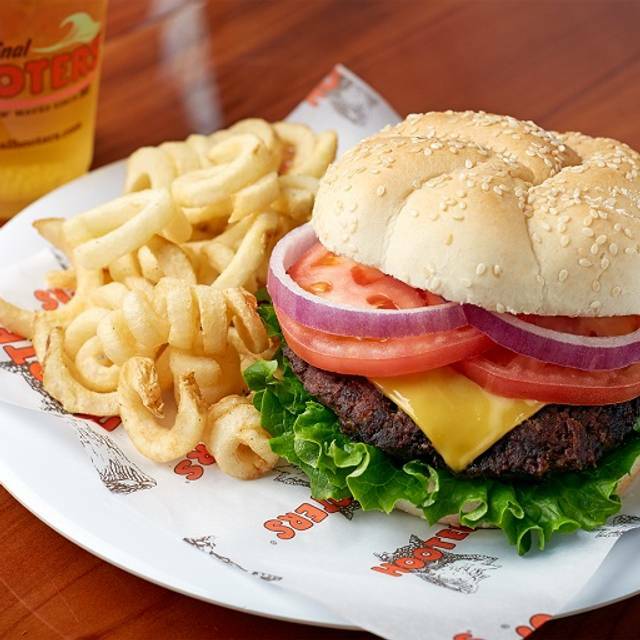 You must make reservations at least 5 minutes in advance of the time at Hooters of O'Hare. Jalapeños, chili, cheese sauce, tomatoes, and sour cream on fries. These are hot patatas! It has great food especially their wings. I highly recommend people come to this restaurant. Good comfort food served efficiently by friendly (cute!) wait staff. Have been to this location several times, but feel that the overall quality and experience is diminishing. Maybe will try once more then move on. The host and server are fun, energetic and friendly.Great service. Delicious wings. Hooters O'Hare never disappoints. I like the wings at Hooters better than other wing places. It can get pretty crowded with long wait times but I just recently found out you can make reservations through Open Table. That helps a lot. We have been to this location several times to eat and this is the first time we have ever been treated poorly by a server. The server got our entire order wrong and instead of being apologetic and making sure our order would be corrected, she was very rude and unprofessional. I do have to give tremendous kudos to management. After speaking with a manger of the incident, she helped get our order corrected and brought it to us promptly. I also asked if we could have another server which management helped make happen. Management needs to re-train Brittany on customer service. 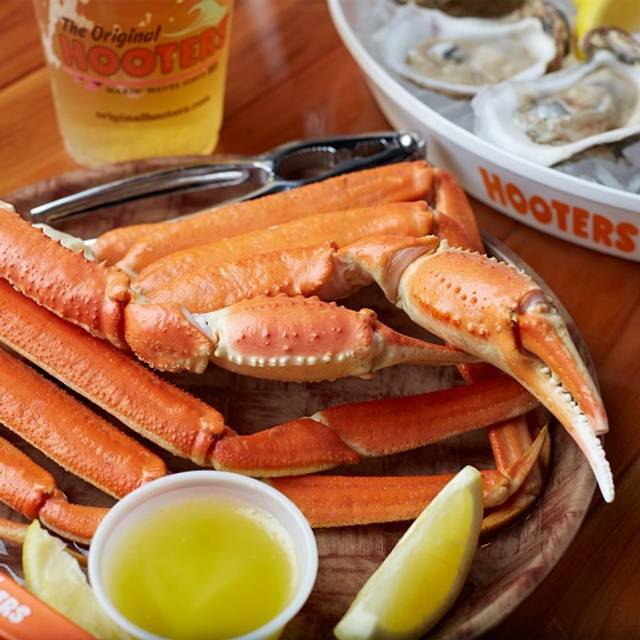 We love hooters, but sunday was a bad day to eat there. We came for dinner with family after a family get together. We ordered our food, then the waitress comes back to tell us that they are all out of mac n cheese, we had 3 children that wanted mac n cheese. Then my daughter ordered the chocolate cake and was told they were out of that also. Food was not as hot as it should of been, normally we would send it back but it was getting late and the kids were tired. As a chef,, I have so much gratitude for anyone who works in my field! It’s hard work but when I go out I don’t expect to wait for 30min to get my drinks especially if it’s just a lemonade and especially don’t like to be charge twice for said lemonade, because by the time I received it I downed it and had another, the manager comped me 15% off when he should have comped my whole meal! Still tipped the poor girl but I won’t go back there,,, downtown only for me now! Hostess was so nice. We sat behind a huge party which was loud and they kept bumping into us. The hostess immediately came up to us and told us she would like to move us. We went with a group of people for a birthday. They wouldn't split the bill. Ok...no big deal. We split up the bill & paid with a combination of credit cards & cash. 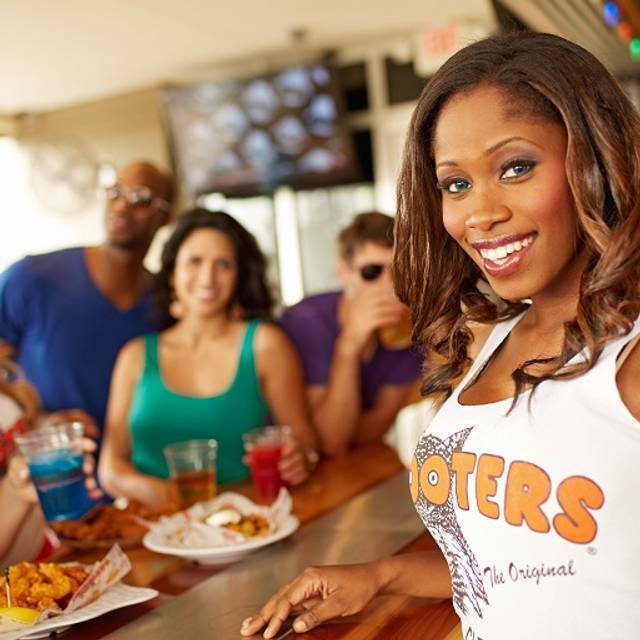 Hooters added an additional 18% to the bill because we paid with a combination of cash & credit! We had 14 people & the bill was close to $400.00! This was not told to us until we were paying the bill. It would have been nice if the waitress, manager, anyone had bothered to mention this fact when we asked for separate checks. I was extremely disappointed in this. In addition they put our table in between 2 pillars so you had to look behind the pillar to talk to the person sitting next to you! I had made the reservation 3 days in advance so Hooters knew we were coming. It wasn't a last minute rush to find a place for 14 people. This used to be our go-to place but it will be awhile before I go back again! It was a great place to celebrate the birthday of a 16 year old. Other than the waitress being nice and the boy having a great time; we won't go back. The roof leaked on our table and seat. The ambiance and seeing the 16 yo celebrate was well worth it. It was a wonderful evening and our waitress was amazing. After reading the other reviews we figured our visit could be good or bad we used the OpenTable which our reservation was supposed to be for 9:45 when we arrived I told her that we reserved a table and she looked at me like she did not know what I was talking about she went over to talk to the manager for a good while she never came back after telling us she would be right with us we got to our table around 10:30 and the service was great at the table but I would never use Open Table to reserve a spot ever again because we still had to wait for three people to go ahead of us before we were ever sat at a table! We love going to Chicago but we will not be going back to this Hooters! The only issue we had at our table was the check we were given someone else's check and they charged my husband's card the other person's bill when they went back to fix it they said that they took that charge off and we were charged our regular bill but we were still charged the other person's table which was significantly more than what our table was! So I would really pay attention to your check before paying!! We made reservation to get there at 9 pm we got there and they made us wait 45 mins, they said it was because they're iPad was not working,I just think that they could've have communicated to us or not let us make no reservations. I love going to the original Hooters it is bigger than the Melrose park location. Service is never bad and I love that I can use open table to make a reservation and avoid the long wait. Great food as always. Service was excellent. Love this location!! Took almost an hour to get our food. Then the order was wrong. Went to watch Super Bowl, got there enough so the staff was accommodating enough to allow us to switch tables. Thanks. I am glad I used Open Table to reserve a table. Went to see the football playoffs and it was very crowded. Although the last couple of times I went, the waitress was ending her shift half way through our meal, which was a bit annoying. Food and the staff is always great and love going there!! Sunday funday at its best !! We had 1 server for 27 people and she didn't seem to pay any attention. We went 30 minutes before she even greeted us and another 30 minutes before we got our drinks. food orders were wrong multiple times and no manager was ever notified. I was celebrating my 30th birthday and she was horrible to say the least. The waitress (Avy) was great. She made sure our table was well serve. Portions were great! Also loved my mojito.